For information about Finnish Karelians, see Karelia (Finland). Karelians (Karelian : karjalaižet) are a Baltic-Finnic ethnic group who are native to the Northern European historical region of Karelia, which is today split between Finland and Russia. Karelian is a Finnic language spoken mainly in the Russian Republic of Karelia. Linguistically, Karelian is closely related to the Finnish dialects spoken in eastern Finland, and some Finnish linguists have even classified Karelian as a dialect of Finnish. Karelian is not to be confused with the Southeastern dialects of Finnish, sometimes referred to as karjalaismurteet in Finland. Historical regions are geographic areas which at some point in time had a cultural, ethnic, linguistic or political basis, regardless of present-day borders. They are used as delimitations for studying and analysing social development of period-specific cultures without any reference to contemporary political, economic or social organisations. The fundamental principle underlying this view is that older political and mental structures exist which exercise greater influence on the spatial-social identity of individuals than is understood by the contemporary world, bound to and often blinded by its own worldview - e.g. the focus on the nation-state. In Russia, Karelians mostly live in the Republic of Karelia where there are the designated ethnic group and in other adjacent north-western parts of the country. There are also significant Karelian enclaves in the Tver and Novgorod oblasts, as some Karelians migrated to those areas after the Russo-Swedish War of 1656-1658. The Republic of Karelia is a federal subject of Russia, located in the northwest of Russia. Its capital is the city of Petrozavodsk. Its population in 2010 was 643,548. Tver Oblast is a federal subject of Russia. Its administrative center is the city of Tver. From 1935 to 1990, it was known as Kalinin Oblast, named after Mikhail Kalinin. Population: 1,353,392. Novgorod Oblast is a federal subject of Russia. Its administrative center is the city of Veliky Novgorod. Some of the oldest Russian cities, including Veliky Novgorod and Staraya Russa, are located in the oblast. The historic monuments of Veliky Novgorod and surroundings have been declared a UNESCO World Heritage Site. Population: 634,111. In Finland, Karelians traditionally live in the regions of Savonia and Northern and Southern Karelia. The historic homeland of the Karelians is the Karelian Isthmus, Ladoga Karelia, Olonets Karelia in Russia and the regions of North and Southern Karelia and Savonia in Finland. Finland comprises 19 regions, called maakunta in Finnish and landskap in Swedish. The regions are governed by regional councils, which serve as forums of cooperation for the municipalities of a region. The main tasks of the regions are regional planning and development of enterprise and education. In addition, the public health services are usually organized on the basis of regions. Currently, the only region where a popular election is held for the council is Kainuu. Other regional councils are elected by municipal councils, each municipality sending representatives in proportion to its population. Savonia is a historical province in the east of Finland. It borders Tavastia, Ostrobothnia, and Karelia. In current day, Savonia is divided in two provinces Northern Savonia and Southern Savonia. The largest cities in Savonia by population are Kuopio, Mikkeli, Savonlinna, Varkaus and Iisalmi. North Karelia is a region in eastern Finland. It borders the regions of Kainuu, Northern Savonia (Pohjois-Savo), Southern Savonia (Etelä-Savo) and South Karelia, as well as Russia. Sigtuna is a locality situated in Sigtuna Municipality, Stockholm County, Sweden with 8,444 inhabitants in 2010. It is the namesake of the municipality even though the seat is in Märsta. Sigtuna is, despite its small population, for historical reasons often still referred to as a stad. Statistics Sweden, however, only counts localities with more than 10,000 inhabitants as stads . The first mention of Karelians in ancient Russian chronicles dates to 1143 AD  when the Novgorod chronicle mentions that Karelians raided neighbouring Tavastia (Häme). Ancient Russian chronicles referred to ancient Karelians as Koryela. Until the end of the 13th century, Karelians enjoyed a period of relative independence and self-government. However, as Karelians came in contact with Novgorod some of them started to take part in the Novgorodian internal and external politics. Russian chronicles mention a joint raid of Novgorod and Karelians on Tavastia in 1191. In the 12th century, the Karelian relationship with Novgorod underwent significant changes, from partnership and alliance to gradual dominance by the latter. Tavastia is a historical province in the south of Finland. It borders Finland Proper, Satakunta, Ostrobothnia, Savonia and Uusimaa. Subsequent wars had Karelians fighting on both sides of the conflict and often against each other. Meanwhile, Karelians on the Novgorodian and later Russian side of the border continued to settle northward towards the White Sea. By the late 14th century, Russian Karelians established control over White Karelia and came in conflict with the Norwegians on the peninsula of Kola. As the struggle for power in the region continued over the next centuries the borderline between Sweden and Russia moved several times with most of the changes happening in Northern Karelia and Kainuu. However, in 1617, the history of Karelians underwent a significant change as Russia ceded to Sweden, along with other territories, the eastern part of the Karelian Isthmus, Ladoga Karelia and certain parts of Northern Karelia. This meant that the majority of Karelians were again living in one country, yet it did not bring peace to the Karelian people. As Sweden commenced the process of conversion of population of the ceded territories to Lutheran Protestantism, resistance appeared among Old-Believer Orthodox Karelians and neighbouring Orthodox Izhorians. By the mid 17th century, the tension between the Lutheran Swedish government and Orthodox Karelians led to yet another conflict between Sweden and Russia. From 1656 to 1658, Russian armed forces waged war on Karelian territories and tried to recapture them with the aid of some of the sympathizing local Orthodox population, but after two years of fighting both sides came to a stand-still. Many of the Karelians who remained Orthodox by 1658 AD were unwilling to remain in Sweden and convert to Lutheranism, which triggered a mass migration of many Orthodox Karelians from these areas into other parts of Russia, some going to the region of Tver and forming the Tver Karelians minority, while others moved to the region of Valdai in the Novgorod region and yet others to White Karelia by the White Sea. As some of the lands in the eastern Karelian Isthmus and Ladoga Karelia became partially depopulated Sweden decided to move settlers from Savonia to those Karelian lands which resulted in a mixture of local Karelians with Savonians in some areas. However, as Savonians themselves are of Karelian origin, this migration mostly affected local Karelians religiously (as the majority of the population became Lutheran) and to some extent linguistically, but it did not bring major changes to the ethnic map of Karelia. The next change happened in 1721 as Russia won the great northern war against Sweden (1700–21), which forced Sweden to cede the entire Karelian Isthmus and Ladoga Karelia to Russia, with its now mostly Lutheran population. Although there were attempts to convert the local population to Orthodoxy these did not meet with any success. After Russia conquered the entire Finnish territories in yet another Russo-Swedish war in 1808–09, it was decided to join the Karelian Isthmus and Ladoga Karelia to the newly formed Grand Duchy of Finland in 1812, which brought all western Karelians into the same state with Finns, while eastern Karelians remained under independent Russian administration. Although Karelians ended up in the same country the religious difference between eastern and western Karelians remained a dividing factor, which somewhat affected the linguistics but even until the beginning of the 20th century both groups could understand each other. Yet eastern Karelians managed to preserve traditions and folklore better than their western brothers. As the Grand Duchy of Finland was formed, its inhabitants struggled to properly identify themselves ethnically, some being Finnish, some Swedish and some Karelian. As the Fennoman movement started and the new Finnish nation commenced its forming and shaping process, attempts were made to restore the lost Finnish identity. The process of "finnisation" of Finland started. As part of that process during the 19th century, Finnish folklorists including Elias Lönnrot traveled to different parts of Eastern Karelia to gather folklore and epic poetry. The Orthodox Karelians in North Karelia and Russia were now seen as close brethren or even a sub-group of the Finns. The ideology of Karelianism inspired Finnish artists and researchers, who believed that the Orthodox Karelians had retained elements of an archaic, original Finnish culture which had disappeared from Finland. This led to numerous confusions with some claiming that western and eastern Karelians were different nations. As Finland gained its independence in 1917 the process of "finnisation" continued, but now even eastern Karelians were viewed as part of the Finnish nation. From 1918 to 1922, Finland made several attempts to expand into Eastern Karelia with some support by local Karelians. Several thousands of eastern Karelians migrated to Finland by 1922 from different parts of Eastern Karelia. After the Winter War, Finland had to cede the Karelian Isthmus and Ladoga Karelia to the USSR. As the local Karelian population was unwilling to end up under Soviet rule, over 400,000 people were evacuated across Finland's new border from the territories that were to be ceded. After the Continuation War (1941–1944), in which Finland temporarily held most of Eastern Karelia, several thousands of Karelians chose to migrate west as Finnish forces retreated. [ citation needed ] The Karelians who migrated to Finland in the 20th century were initially Karelian speakers, but due to minor lingual differences and in order to assimilate into the local communities soon adopted the Finnish language after the war. Some of the evacuees later immigrated, mainly to Sweden, Australia and North America. The Karelian language is closely related to the Finnish language, and by some Finnish and Karelian linguists is viewed as a dialect of Finnish language. The biggest difference between the two languages is that while Finnish language borrowed many words from Swedish, the same happening with western Karelian dialects, eastern Karelian dialects borrowed many words from Russian, which leads to certain differences and difficulties in understanding one another. There are currently 7 different dialects of what can be classified as dialects of Karelian language: karelian proper, which is spoken in White Karelia in the Russian side of the border; livvi – a dialect spoken in Aunus (Olonets) Karelia. Lyydi – which is spoken in certain areas between Ladoga and Onega lakes. Old Karelian women in Sambatuksa (Sammatus), Russian Karelia. Significant enclaves of Karelians exist in the Tver oblast of Russia, resettled after Russia's defeat in 1617 against Sweden — in order to escape the peril of forced conversion to Lutheranism in Swedish Karelia. The Russians also promised tax deductions if the Orthodox Karelians migrated there. Olonets (Aunus) is the only city in Russia where the Karelians form a majority (60% of the population). Karelians have been declining in numbers in modern times significantly due to a number of factors. These include low birthrates (characteristic of the region in general) and especially Russification, due to the predominance of Russian language and culture. In 1926, according to the census, Karelians only accounted for 37.4% of the population in the Soviet Karelian Republic (which at that time did not yet include territories that would later be taken from Finland and added, most of which had mostly Karelian inhabitants), or 0.1 million Karelians. Russians, meanwhile, numbered 153,967 in Karelia, or 57.2% of the population. By 2002, there were only 65,651 Karelians in the Republic of Karelia (65.1% of the number in 1926, including the Karelian regions taken from Finland which were not counted in 1926), and Karelians made up only 9.2% of the population in their homeland. Russians, meanwhile, were 76.6% of the population in Karelia. This trend continues to this day, and may cause the disappearance of Karelians as a distinct group. Lake Ladoga is a freshwater lake located in the Republic of Karelia and Leningrad Oblast in northwestern Russia, in the vicinity of Saint Petersburg. The Karelian Isthmus is the approximately 45–110 km wide stretch of land, situated between the Gulf of Finland and Lake Ladoga in northwestern Russia, to the north of the River Neva. Its northwestern boundary is the relatively narrow area between the Bay of Vyborg and Lake Ladoga. If the Karelian Isthmus is defined as the entire territory of present-day Saint Petersburg and Leningrad Oblast to the north of the Neva, the isthmus' area covers about 15,000 km2. 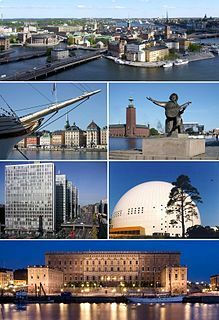 The Finnish Orthodox Church, or Orthodox Church of Finland, is an autonomous Eastern Orthodox archdiocese of the Ecumenical Patriarchate of Constantinople. The Church has a legal position as a national church in the country, along with the Evangelical Lutheran Church of Finland. Historical Ingria is the geographical area located along the southern shore of the Gulf of Finland, bordered by Lake Ladoga on the Karelian Isthmus in the north and by the River Narva on the border with Estonia in the west. Karelia is an historical province of Finland which Finland partly ceded to Russia after the Winter War of 1939–40. The Finnish Karelians include the present-day inhabitants of North and South Karelia and the still-surviving evacuees from the ceded territories. Present-day Finnish Karelia has 315,000 inhabitants. The more than 400,000 evacuees from the ceded territories re-settled in various parts of Finland. Korela Fortress, at the town of Priozersk, Leningrad Oblast, Russia. 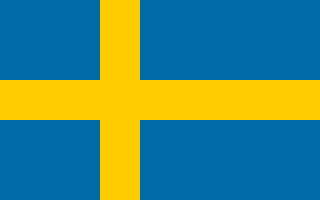 Swedish Ingria was a dominion of the Swedish Empire from 1583 to 1595 and then again from 1617 to 1721, when it was ceded to the Russian Empire in the Treaty of Nystad. Livvi-Karelian is a Finnic language of the Uralic family spoken by Olonets Karelians, traditionally inhabiting the area between Ladoga and Onega lakes, northward of Svir River. The name "Olonets Karelians" is derived from the territory inhabited, Olonets Krai, named after the town of Olonets, named after the Olonka River. Greater Finland is an irredentist and nationalist idea that emphasized territorial expansion of Finland. The most common conception of Greater Finland was defined by natural borders encompassing the territories inhabited by Finns and Karelians, ranging from the White Sea to Lake Onega and along the Svir River and Neva River—or, more modestly, the Sestra River—to the Gulf of Finland. Some proponents also included the Kola Peninsula, Finnmark, Torne Valley, Ingria, and Estonia. The Savonian dialects are forms of the Finnish language spoken in Savonia and other parts of Eastern Finland. It belongs to the eastern Finnish dialects and it is divided to more specific dialect groups. The Olonets Governorate or Government of Olonets was a guberniya (governorate) of north-western Imperial Russia, extending from Lake Ladoga almost to the White Sea, bounded west by Finland, north and east by Arkhangelsk and Vologda, and south by Novgorod and Saint Petersburg. The area was 57,422 m², of which 6,794 m² were covered by lakes. Swedish–Novgorodian Wars were a series of conflicts in the 12th and 13th centuries between the Republic of Novgorod and medieval Sweden over control of the Gulf of Finland, an area vital to the Hanseatic League and part of the Varangian-Byzantine trade route. The Swedish attacks against Orthodox Russians had religious overtones, but before the 14th century there is no knowledge of official crusade bulls issued by the pope. The History of Karelia is about the cultural and geopolitical region of Karelia, in present-day eastern Finland and northwestern Russia in northern Europe. The Karelian people's presence can be dated back to the 7th millennium BC—6th millennium BC. 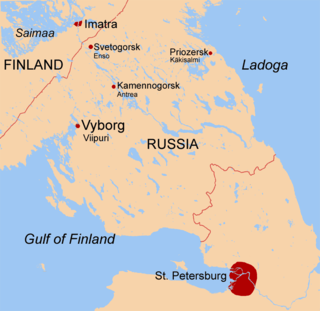 The Finnish–Novgorodian wars were a series of conflicts between Finnic tribes in eastern Fennoscandia and the Republic of Novgorod from the 11th or 12th century to the early 13th century. The Finnish military administration in Eastern Karelia was an interim administrative system established in those areas of the Karelo-Finnish Soviet Socialist Republic (KFSSR) of the Soviet Union which were occupied by the Finnish army during the Continuation War. The military administration was set up on July 15, 1941 and it ended during the summer of 1944. The goal of the administration was to prepare the region for eventual annexation into Finland. Tver Karelians are a people who inhabit regions of Tver, Saint Petersburg, and Moscow. Their dialect is remarkable in that it does not borrow from other Baltic-Finnish languages due to centuries of geographical isolation. Although the number of Tver Karelian people is about 14,633, very few name the dialect as their primary language. ↑ Minahan, James (2000). One Europe, Many Nations. Greenwood Publishing Group. p. 368. ISBN 978-0-313-30984-7. ↑ "The Flags of Karelia". Heninen.net. Retrieved 2017-03-12. ↑ "Russian census of 2010" (XLS). Gks.ru. Retrieved 2017-03-12. ↑ Languages of Finland. "Finland". Ethnologue.com. Retrieved 2017-03-12. ↑ "Ethnic composition of Ukraine 2001". Pop-stat.mashke.org. Retrieved 2017-03-12. ↑ "RAHVASTIK RAHVUSE, SOO JA ELUKOHA JÄRGI, 31. DETSEMBER 2011". Pub.stat.ee. Retrieved 2017-03-12. ↑ Национальный статистический комитет Республики Беларусь (PDF). Национальный статистический комитет Республики Беларусь (in Russian). Национальный статистический комитет Республики Беларусь. Archived from the original (PDF) on 18 February 2018. Retrieved 1 August 2012. ↑ "Latvijas iedzīvotāju sadalījums pēc nacionālā sastāva un valstiskās piederības (Datums=01.01.2018)" (PDF). Retrieved 18 February 2018. ↑ Barbara A. Anderson and Brian D. Silver, "Estimating Russification of Ethnic Identity among Non-Russians in the USSR," Demography 20 (November, 1983): 461–489.